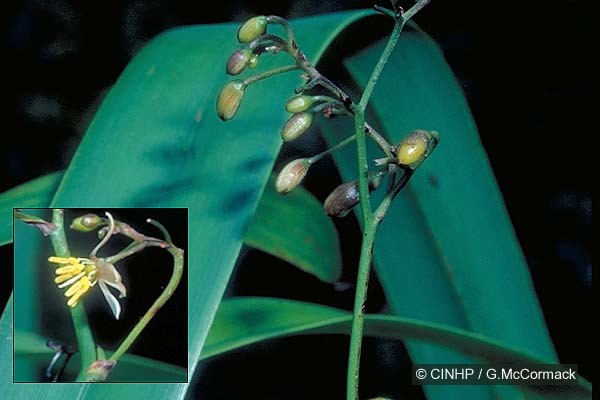 KEY FEATURES: FORM: herb, lily, to 1m, cluster of narrow stems with drooping leaves. LEAVES: alternate. SHEATH: distally fused, 30cm, 15x2mm, keel slightly rough. BLADE: lance-like, widest near centre, 70x3.3mm, glossy, dark green, keel prominent and smooth. INFLOR: drooping, within foliage, 40cm with about 8 clusters of c.25 flowers. FLOWERS: small, white. FRUIT: glossy, purple, 15x10mm, a berry with small seeds in soft flesh. SEEDS: ovoid, 4x2mm, glossy, black. GENERAL NOTE: ACSm moved from Liliaceae to Phormiaceae.